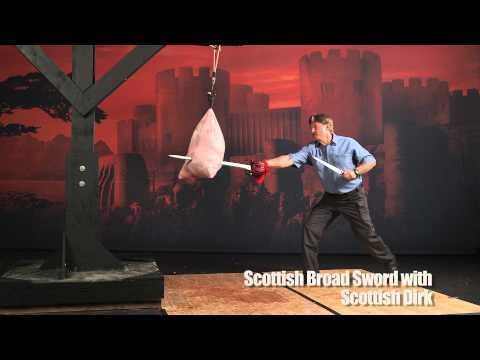 With no apologies to the stage props and costume accessories that often bear its name, the Cold Steel Scottish Dirk is a modern replica that harkens back to an earlier time when the dirk was a functioning tool and weapon. The 13″ long 1½” wide blade is forged to a hard spring temper from 1055 high carbon steel, fully sharpened and battle-ready. The attractive Rosewood handle is capped with a contrasting blued-steel guard, bolster and disc-shaped pommel. The package is completed with a handsome leather scabbard featuring a blued-steel throat and chape and an extra wide belt loop. This is the perfect companion piece to complete your Highland ensemble, a real fighting dirk instead of a useless piece of metal.